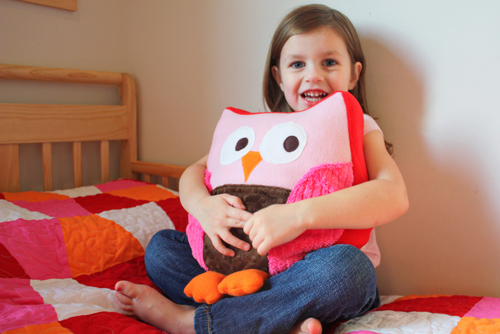 This snuggly owl pillow is the perfect addition to any child’s arms. It’s made with love and totally customizable. 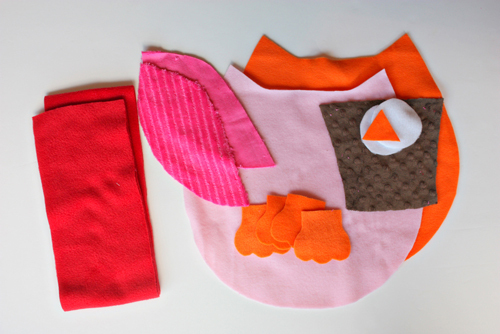 Try it once then create it again and again using different colors and fabrics as gifts or treats for the little ones in your life. 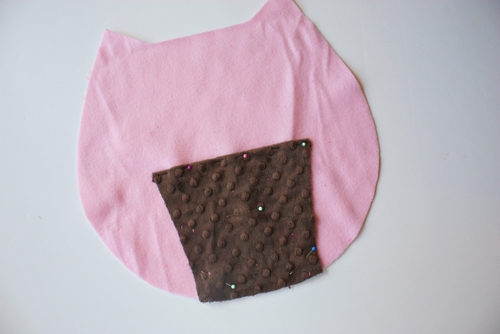 Step 1) Cut out all pattern pieces in the colors and fabrics of your choice. 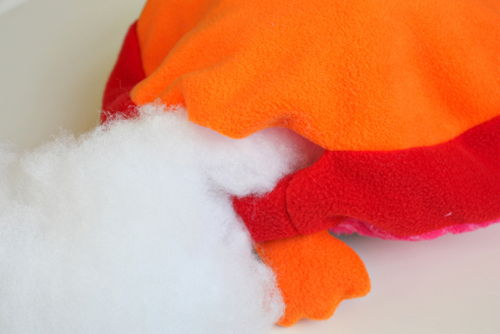 Step 2) Stitch the “body parts” to the owl base. 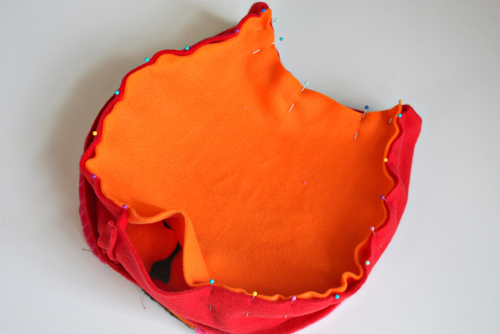 Lay the bodice on top of the front owl base, using the pattern as a guide. 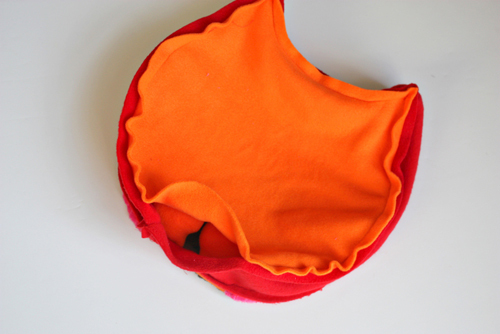 Fold under the top edge 1/4″ and pin in place. Sew close to the edge along the top, then the two sides, attaching the bodice to the owl base. There’s no need to fold the side edges under, as they will be covered up later. Lay the wings on top of the owl base. 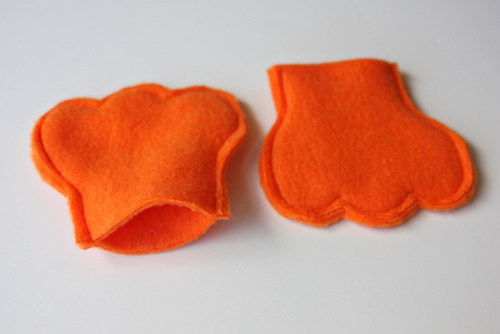 Fold under the inner edges 1/4″ and pin in place. 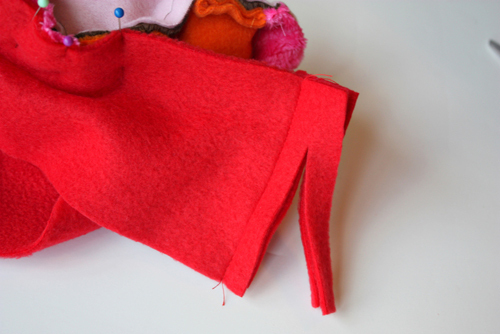 Sew close to the pinned edges of the wings, attaching them to the owl base. 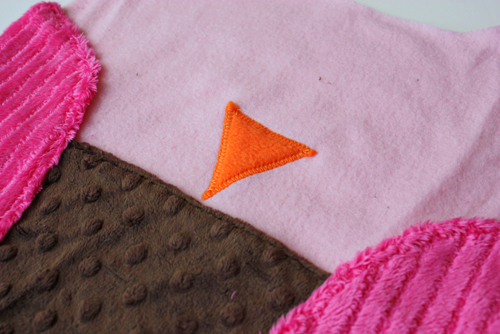 Pin the beak in place and zigzag close to the edge of all three sides. Do the same with the outer eyes. Repeat for the inner eyes. Step 3) Add the feet. Pin two of the feet pieces right sides together. 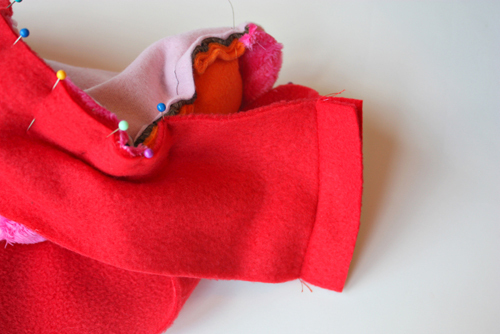 Sew around the outer edges with a 1/4″-wide seam allowance. Do the same with the remaining two feet pieces. Turn both feet right side out and stuff with a bit of batting. With the batting stuffed down in the each foot, pin the feet to the bodice/owl base, matching the raw edges and aligning the outer edge of each foot with the inner edge of a wing. 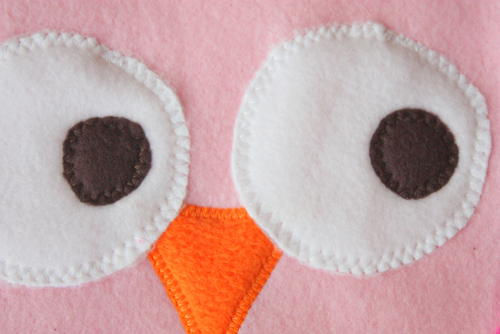 Stitch the feet to the owl base using a 1/2″-wide seam allowance. Step 4) Pin the center strip to the owl base. Begin lining up the center strip along the outer edge of the owl, starting at the very bottom of the owl. 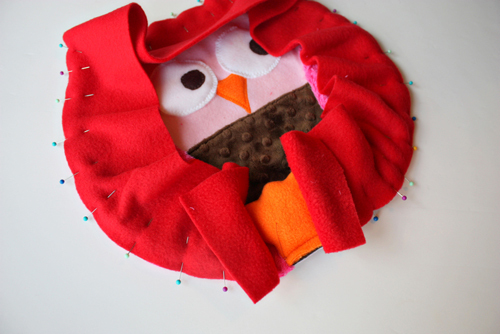 Use pins to attach the center strip to the owl, but leave a few inches of the center strip free at the very beginning. Continue pinning until you approach the first point at the top of the owl. Manipulate the edge of the center strip as needed as you align it with the curves of the owl. 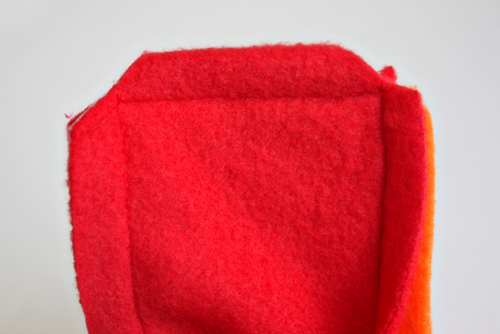 A corner will need to be made at the point, so flip the center strip up, making a diagonal fold. Keep the left edge of the center strip even with the left side of the point. 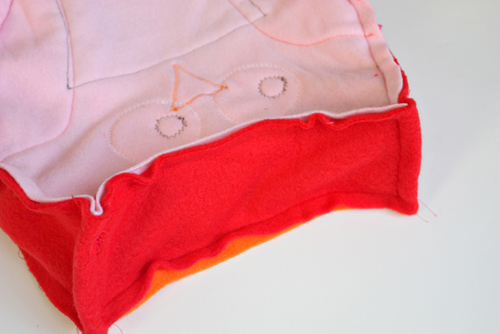 See how the red and pink fabrics make one continuous line for a few inches? Keeping that angle in place, flip the center strip down, keeping that top fold of the center strip even with the top of the point. Keep those edges on the left even with each other. Pin it all in place as you go. 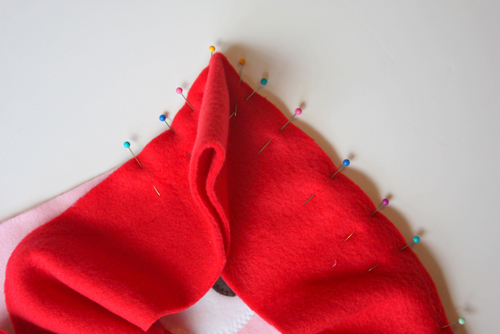 Continue pinning, folding, and pinning the center strip around the second point the same way as the first. When you reach the end of the strip, leave a few inches free at the end. Place the two center strip ends right sides together and pin them together. 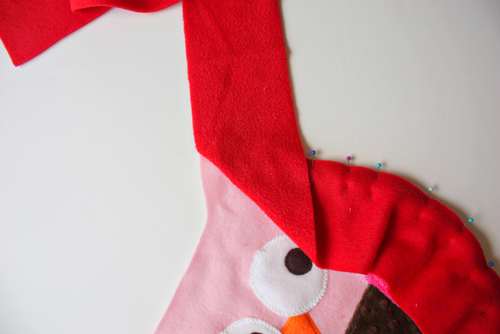 The center strip may have stretched as you pinned it around the owl, so adjust where the ends are pinned together so that the center strip forms a continuous piece of fabric around the owl. 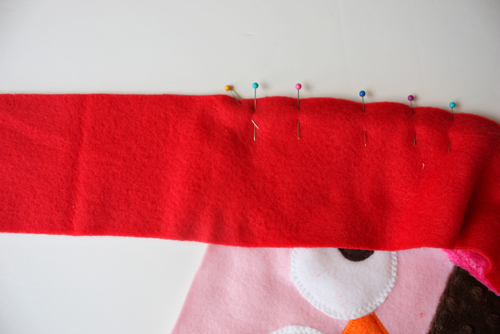 Pin this section of the center strip to the owl base, matching up the outer edges. Step 5) Stitch the center strip to the owl base. 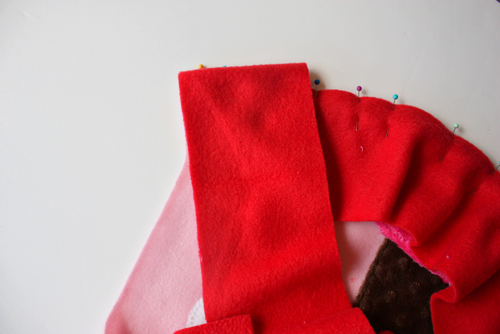 Begin sewing the center strip to the owl base, using a 1/2″-wide seam allowance, stopping as you near the first point/corner. 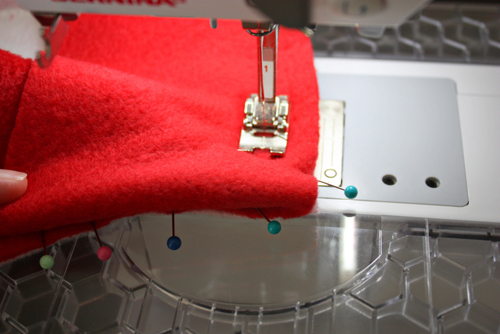 As you near the point, keep the fold of fabric folded away from the needle. 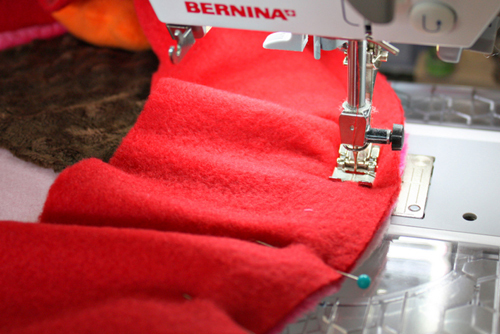 Continue to sew, stopping 1/2″ before the end of the point. 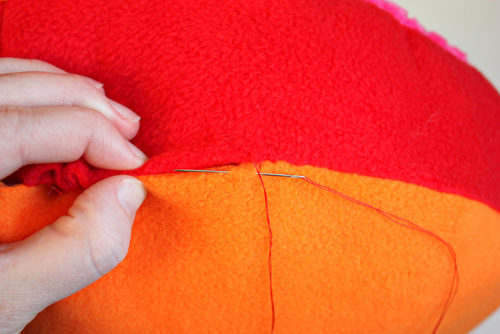 Backstitch a few times, but don’t cross into that 1/2″ space at the end. 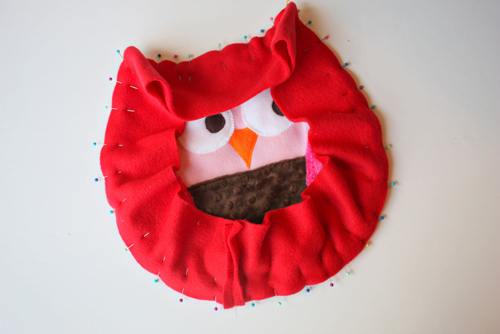 Turn your owl to begin sewing around the other side of the point. 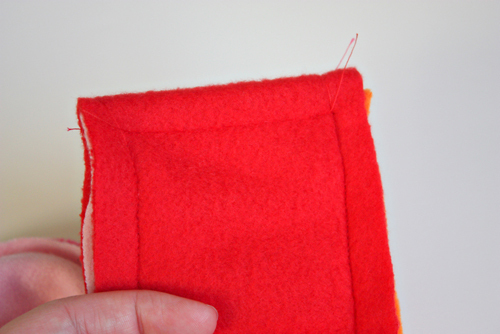 Flip the fabric away from the needle, and then place the needle down in the fabric 1/2″ from the end. 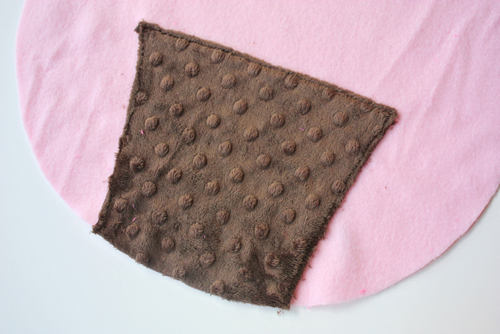 Backstitch a few times, but don’t cross into the 1/2″ space at the beginning. Continue stitching the center strip to the owl base, turning the corner at the second point the same way as the first. Continue stitching all the way around the owl base. Step 6) Stitch the front and back together. Place the owl back base right sides together with the front owl base. Pin the edges of the back owl base to the center strip, matching up the tops of the owl’s head so that the points are directly across from each other. 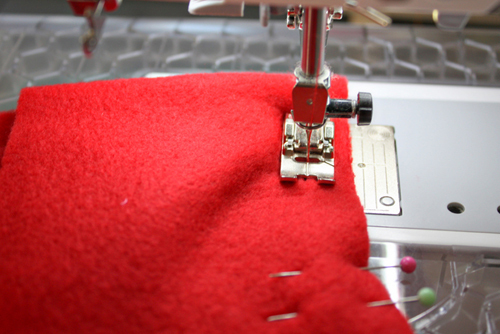 Be sure that you are pinning right sides together. 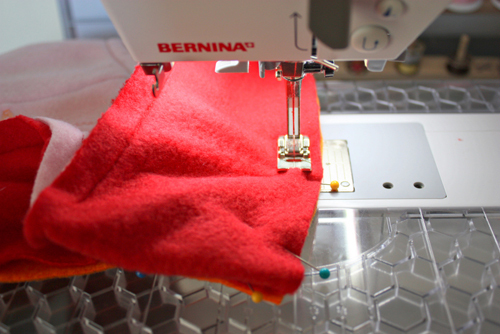 Place the owl under the sewing machine presser foot with the center strip facing up; this will allow you to maneuver the fabric around the points the same way that you did when attaching the first side. 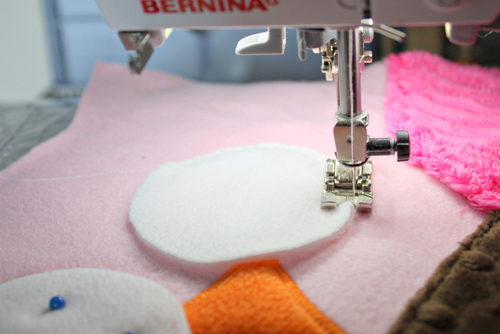 Stitch using a 1/2″-wide seam allowance, leaving about a 4″ opening along the bottom edge of the owl. Step 7) Make the owl ears. At the top of the owl, pinch the points on one side together, creating a fold along the center strip from the back point to the front point. Repeat for the other set of points. 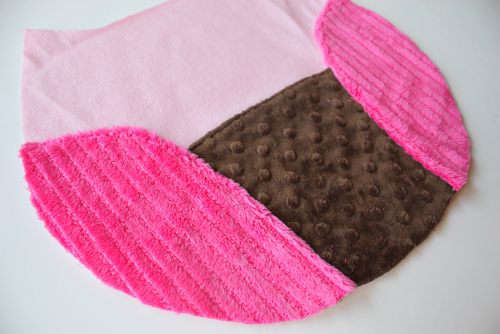 Sew a straight line 1/2″ below the folds in the center strip. 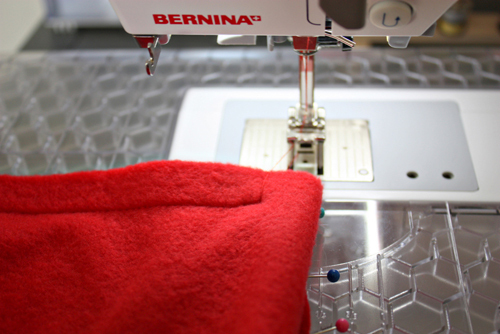 Start at the end of one of the vertical lines, sewing to the other one as shown in the photo. Do the same with the other point. 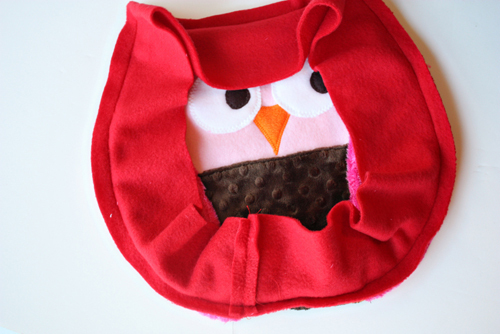 This will help create nice creases and folds for the points of the owl after you turn it right side out. 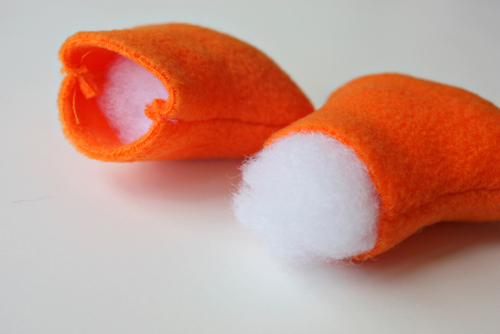 Trim off both corners of each end, being careful not to clip through any seams. Step 8) Stuff your owl. Stuff your owl full of polyester stuffing. 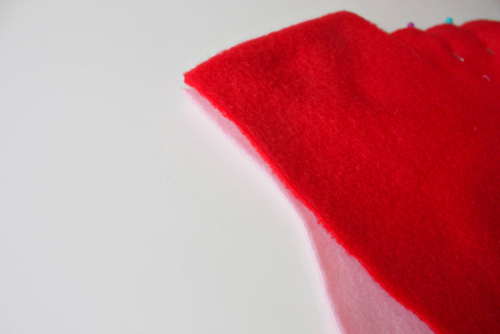 Fold the opening edges toward the inside 1/2″, and then hand-stitch the opening closed. 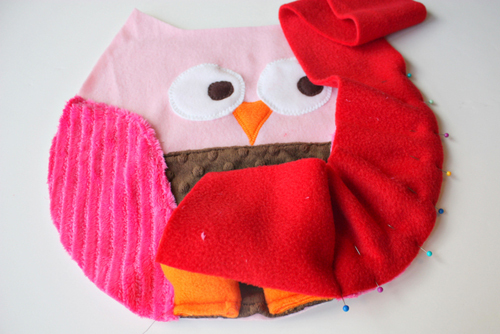 Hi Joy, the pattern is downloadable in a PDF file, just click on the text that says, “Snuggly Owl by Ashley Johnston” under the picture of the owl. 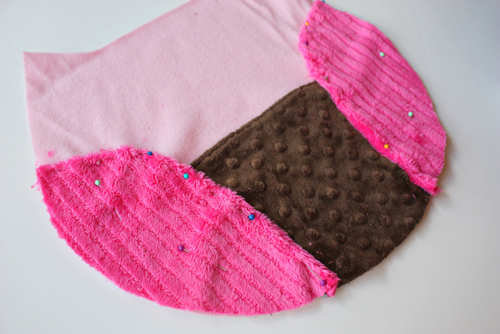 Easy and concise pattern with adorable results. My friend and I just tried this pattern together and we both LOVED our owls! They turned out extremely cute, if you would like to see pictures just check out http://modsprouts.com/?p=440. What am I doing wrongt? It’s prettier if on the back you just add two pieces of fabric(like an envelope)Then you’ll have a pajama bag. Kids will love it. Pingback: Let’s Decorate: Melonnie’s Birdie Boys Room « hey, beth baker! Can’t seem to open the PDF pattern, it says that the link is broken. Could you please send me the pattern. Love this pattern!. I liked it so much that I made one for each of my daughters friends. This is a keeper. I can’t seem to download the pdf. Can I get it sent to me? Please may you email me the pdf too as I can’t open it from this page- sorry to trouble you! Will you please email me the pattern? So excited to make these for Christmas! Hi there, the down load I can not see the long strip that goes between the front and back please guide me.